Seems a little late for an Ahim backstory/"I need to learn to trust my friends" episode, but it was okay. I really liked Ahim's idea of using the wanted posters to show that she's alive and fighting Zangyack. As well as Marvelous rebuking her and saying "if you want to be a symbol for your people, you shouldn't be a pirate". The pair fighting at the end was pretty awesome. Oh yeah, they finally did a non-red charge for GokaiGalleon Buster. I wonder if we'll see a series of them now. This was a surprisingly dark episode for a sentai. Famille blowing up all around Ahim and her parents getting crisped about 5 feet in front of her? Harsh, but I think that really emphasized just how strong Zatsurigu was, and made her much easier to empathize with. Akudosu's got quite the Star Wars Emperor thing going on. He actually kinda is what I'd imagine a mix of the Emperor and Darth Vader and then Waruzu Giru would be Luke if he was raised by Vader (he even has the whining down). I loved the dual Rekka Daizanto combo by marvelous and Ahim on the monster. This episode was nice, I knew about her background already from previous episodes. Though, seeing a flashback was cool. The episode i am truely looking forward for and have been waiting and hoping...is the next one! This was a deep episode. Ahim's backstory was almost worth the wait. We knew she was a princess from the way she holds herself and her dialect. I know that Japanese is very formal, but she took the cake and made it into a 5-layer masterpiece with it. Especially when you compare it to Marvelous' brash language or Luka's for that matter. I really like the Dual-Attacks that Ahim went with. Some might be a spoiler for their season if you haven't seen them, so I am censoring them. I can't wait until we see how they fight Akudosu in the end. Pink's father was the king from gamecenter CX? If Zubat met this villain, would he be like "you're only the second best at destroying planets"...? Silly Pink. Skirts can't get revenge on their own. Warzolemew Gill's father seems to be a bit too much evil. He needs to hit that sweet spot. Oh wow, thats kind of dark (and being and Ahim episode to boot). I wonder who doesn't have someone related to them have a death by backstory? Fleshing out some more of the character's past this late in the game? I don't know how to feel about that. Its great that we get to learn more about Ahim, but didn't they learn that lesson already? seems like she's taken a few steps back. I don't think the emperor is being overly evil(yet). It looks like he's grieving by getting revenge for his recently deceased son. Mystery King of know-nothingness, thats me! I accept so much absurdity in these shows, but for some reason I can't accept Ahim and her family being able to stand on a molten planet without dieing immediately. Sure they were on a kind of island, but I don't think that would have saved them. Then again they only look human. Maybe her species can withstand those temperatures? The emperor, for dropping his armada out of hyperspace THROUGH the existing fleet as a widespread punishment/massacre just to prove how evil he really is before we ever even see his glorious Sentai Final Boss design. Don't think it's too late for Ahim's backstory but I would have liked a scene where they gave her the mobirate. For me, that always makes it official and a definity about joining an established team. Really LOVED the duel attacks. Some of the great pairs in recent sentai history and a pair that finally got some long-awaited airtime together. For me, the only odd man out was the Goseiger pair. The pairs they used were sort of exceptions from the main team. Can we think of a girl-girl pair that would have probably suited the theme of these attacks better? Or another pair (boy-boy, boy-girl) that were left out? Also, Ahim's best acting. Those were real tears!! Problem is that there's not any two 6th ranger-type female rangers from the same series (Unless you count DekaBright and DekaGold for the whole 2 seconds they got). 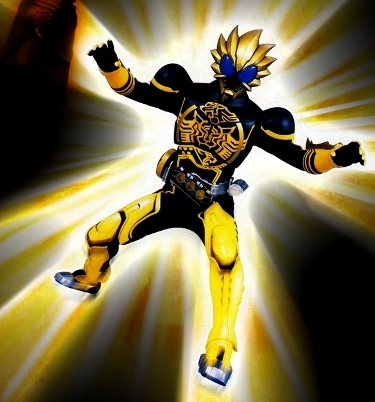 All the rest of them (Go-On Wings, DekaMaster and Swan, ShinkenReds and Goraigers) were rangers outside of the "core" group of 3 or 5, hence why the GoseiPink and Yellow transformation felt so out of place. - They lost of course. Gai's surprise was huge. - Ahim's backstory; truly tragic. She witnessed her parents burnt to death. The whole kindgom being destroyed totally reminds me of the destruction of the 5 tribes in the dinosaur era in Zyuranger. Ahim does resemble Mei HUGELY afterall. - So nice seeing them all comforting Ahim. It doesn't surprise me however. The Gokaiger are perhaps one of the most well-bonded teams. They are a family, and for reasons more than just because they each lost everything (although that was the catalyst). - Nice to see how Ahim joined. She actually walked up and asked for it, something a princess would never do. But it does prove that at that point she did lose everything. - The superimposed Gokaiger symbol during the Kaizoku Sentai Gokaiger call was a great aesthetic touch. - Wow that Imperial Guard is powerful, he just sent them flying into a building, causing the building to collapse. , truly proves that the Gokaiger do not just make dreams to come true, but that they are also a FAMILY. - Ahim stabbing the general in that eye of his was great. - Pirate Girls being used! - Omg paired gokai changes with EACH OF THE OTHER GOKAIGER! Go-On Gold/Go-On Silver, KabutoRaiger/KuwagaRaiger, GoseiPink/GoseiYellow (yay more Goseiger love), DekaMaster/DekaSwan and last but not least ShinkenRed/ShinkenRed (Hime)! - The spam use of the two Rekka Daizantou was truly amazing. Lovely!!! - Ahim has grown. She's not just the weak, shy princess she appeared to be at the beginning. She's not falling asleep while sat anymore. She can hold her own as a Gokaiger, but even more so when she's doing that with everyone else. That's because they are a team. - Amazing episode. It was the perfect Ahim episode. It did her full justice. 10/10. Even now, with less than 20% of the series, left, you still continue to amaze me Gokaiger! Basco, Damaras and the Gokaiger in a pinch! Use of the Rio ranger key as well as more Gekiranger! Oh and Don's past is starting to be revealed! Can't wait! Lunagel wrote: Problem is that there's not any two 6th ranger-type female rangers from the same series (Unless you count DekaBright and DekaGold for the whole 2 seconds they got). All the rest of them (Go-On Wings, DekaMaster and Swan, ShinkenReds and Goraigers) were rangers outside of the "core" group of 3 or 5, hence why the GoseiPink and Yellow transformation felt so out of place. What about Wolzard Fire and MagiMother? It fits their tomboy/princess dynamic, plus Wolzard in a skirt would be interesting. -It's not like male ShinkenRed is outside the main core so the Goseiger pair isn't that off. -Luka's dodge at the beginning is hilarious. -Gai sure has a lot of Gokaiger swag. His socks, muffler, sweater all have his Gokai anchor. An apron this time. -Ahim shouldn't have been able to escape if her parents got fried a few feet in front of her. Might make more sense if she's already on a ship escaping and saw it on a monitor. Most of you probably don't agree, but I don't think Yui Koike is as good of an actress as everyone else there. She's fine, I felt her sadness in those scenes, but I couldn't feel enough anger from her expressions. I dunno, it wasn't because her character's more formal or polite, I just didn't feel the same level of emotion in her acting compared to Joe or Marvelous. I guess I just didn't feel the pent up rage through her acting, and this single episode being her only chance to do it. I think of ep 27 where Don and Luka pulled off each others' mannerisms well. Luka feels spastic boyish geeky, and Don is confident in his/her own skin. If you rewatch their final fight Gokai Change, Don swings like Luka (less head swing, more dainty) and Luka like Don (more crouched, wide swinging arms). I think the director said a while back that he only wanted Doc to be a normal guy and not have some crazy backstory where he's this awesome hero that the audience could've predicted. I think I would've liked Don that way. Therm_Kitty wrote: What about Wolzard Fire and MagiMother? It fits their tomboy/princess dynamic, plus Wolzard in a skirt would be interesting.